As discussed in my book, Color Me Healthy Wealthy and Wise: Transform Your Life with Colors and Crystals, crystals possess electromagnetic properties. The human body is like a liquid crystal. Each cell and organ has its own balanced electromagnetic field. All are interconnected and interact. When the cell’s or organ’s field becomes “unbalanced”—the “force” is disturbed—dis-ease manifests. When the balance is restored, healing begins and homeostasis is restored. Essentially, this is the principle of working with crystals to heal, clear and balance the chakras—our Human Energy System. Crystals grow in their form based on a geometric pattern, which is based on sacred geometry. These patterns create their specific energetic grid, or electromagnetic field. Since the crystal’s field is fixed compared to your “liquid crystal” body, the crystal imposes its grid on your energy pattern. When resonance happens between the crystal and you, your electromagnetic field entrains with the crystal’s. This can have a balancing effect on your energy field, aligning and energizing your body from a cellular to a spiritual level. Sometimes, your body, in its wisdom, doesn’t entrain with the crystal. Perhaps the crystal has already done its job and is no longer needed. Often, individuals keep using a crystal when they no longer benefit from its influence. When this occurs, having the crystal in your energy field, or aura, can have stressful consequences, as the crystal keeps on broadcasting its fixed message to an unreceptive listener. I’ve witnessed this phenomenon with the aura and chakra imaging system. Please keep in mind I am focusing solely on the stress indicators in these examples as other issues are involved. In the before example, the lady showed two high stressor factors in the stress/relaxation and state of mind/body graphs. I inquired if she was under a lot of mental stress and received a negative answer. I noted she was wearing a hematite bracelet, which she wore all the time for “grounding.” I asked her to remove this bracelet so we could look at her aura and chakras without it on. Remarkably, as soon as she repositioned her hand on the sensor, the two stressor graphs indicated a more relaxed and positive state of mind as illustrated in the after photo. When working with crystals, pay attention to your daily energy. Test to determine if the crystal is still working with you (I go into depth about ways to monitor a crystal’s effectiveness in my book.) You may initially love a crystal and resonate with it and it may be best used in small, periodic doses. Think of your favorite comfort food—eating it once or twice may emotionally satisfy yet would you eat that hot fudge sundae every day? Remember, suggestions for applying a crystal for a specific use are just that—suggestions. Everyone is wired differently. Use your intuition and “play” with a crystal. Does the crystal “speak” to you? Can you “feel” its energy? Is its color and looks attractive to you? Each crystal/gemstone has its unique energy signature, one you form a partnership with when you introduce it into your energy field. Is a specific energy signature programmable? Crystals and gemstones have energy signatures corresponding to certain areas of the body and the chakras. For example, rose quartz is associated with the heart chakra, lapis with the throat chakra. Prior to introducing this Pure White Light disc, we took Gerry’s “before” aura and chakra photo. In this photo, Gerry is relaxed although the levels, or volume, of his chakras are low to medium. His aura size circle is at 50%. Noteworthy are the shapes of each chakra, which indicates he currently has an imbalance in the flow of his energy. Then, I asked Gerry to hold, with his right hand, the disc over his heart/sternum. For those practicing applied kinesiology (AK), this is the area where a testing subject holds a product to determine if it is “good for them.” The heart chakra corresponds to the thymus, the immune system and, of course, the heart, which circulates your life blood. If you are testing the AK energetic effect of any item on your body’s energy field (crystals, food, supplements, etc. ), I highly recommend placing it on the sternum, as we did with Gerry. After about a minute with this disc held on his sternum, notice the difference in Gerry’s chakras. All the levels are significantly higher, plus the chakra shapes are approaching round, indicating a better energy flow. The overall look of this aura is also more cohesive. He is attracting more indigo blue into his energy field and integrating it, as evidenced by this blue encircling his aura. His aura size circle is now at 70%, with a slight increase in relaxation. Witnessing a positive energy change in Gerry’s aura after introducing this Pure White Disc, the next step involved introducing this disc into Gerry’s sleep time. Todd suggested placing this disc in a pillow case and sleeping on it, which Gerry did. The first night, Gerry reported every time he closed his eyes, he started dreaming. This first evening was filled with dream images. Although he didn’t remember any specific dream themes, he did remember having dreams, something that was very rare for him. Every night since, Gerry has remembered dreaming. He has only remembered one specific dream involving Michael Jackson. Now, Gerry’s next step is remembering his dreams. The Pure White Disc did deliver on its energetic promise of activating dream time. Next, my adventures with combining the Solar Higher Self disc and crystals . . . Many of you are aware I’m involved with the Emoto Peace Project. Besides serving on the Board of Directors, I’ve been designing and producing graphics for promotions and the website, www.emotopeaceproject.me, which I created. I love the work of the late Dr. Emoto. He pioneered water crystal photography, proving to us that our thoughts and words really do affect our environment. His legacy has inspired many, including me, to carry his message forward—that Love and Gratitude can truly bring peace to our planet and us. Sometimes, I’ve encountered people who doubt Dr. Emoto’s message applies to them. These individuals have reservations that “unseen” forces, such as thoughts, words, crystals or talismans possess “energy” to influence their lives. Which brings me to the service Gerry & I provide—aura and chakra photography. For over ten years, we’ve shown individuals what their human energy field (HEF)—the aura and chakras—looks like. With this amazing tool, we’ve been able to demonstrate how these “unseen” forces impact a client’s HEF. We’re always excited when we see a modality that consistently and positively impacts the HEF. One such “device,” or disc, is the Living Light Alchemy Designs by Todd Rohisson. Todd creates original geometric energy designs that infuse the HEF with higher vibrations of energy. For more specifics on his energy discs, please visit Todd’s website. At several metaphysical fairs attended with Todd, we’ve had the privilege of taking “before and after” aura and chakra photos with a client who purchased or later purchased one of Todd’s discs. I’m always amazed at how rapidly the disc transforms the client’s HEF, raising his/her vibration and allowing their energy to flow. A picture is worth a thousand words—this is the “before” picture of a lady who purchased the Solar Harmonic Balancer Disc. Note the graphs in the lower section of the photo. Each color bar represents one of the seven major chakras. The size of each bar represents the chakra’s volume, or energy level. Most of the chakras have a very low volume. The overall energy levels (upper right hand corner) are uneven and the relaxation level (upper left hand corner) is low. The state of mind body (mid left-hand side) shows some stress. The overall aura size (lower right hand corner) is average. After 15 minutes with Solar Harmonic Balancer Disc in her HEF, the seven chakra graphs are considerably higher in volume, the overall energy levels are more even, and the relaxation level is much greater, along with the overall aura size. This lady is now showing a more positive state of mind body. Overall, the “after” aura colors appear more integrated and flowing throughout her HEF. Plus, her core color has shifted to include more green, which indicates greater heart energy. She is now creating a space of openness to grow and transform. These “before and after” aura and chakra photos reveal the supposed “unseen” effects of energy. Just as Dr. Emoto’s crystals show us the impact of positive thoughts and words on water—both our bodies and Mother Earth are 70% water—an aura and chakra photo demonstrates the influence of positive sources of vibrational energy introduced into our HEF. Schedule sessions and gain insight with our intuitive readers and healers. Sign up for energy or body work. Connect with that special crystal or unique piece of jewelry. Learn more about your body, mind & spirit with books by local authors. Donations accepted for the Emoto Peace Project to support the late Dr. Emoto’s vision of distributing his book The Message of Water to children of all ages around the world. I’d love to see a copy of The Message of Water in every school library across the world. Check out the awesome group participating in the fair. 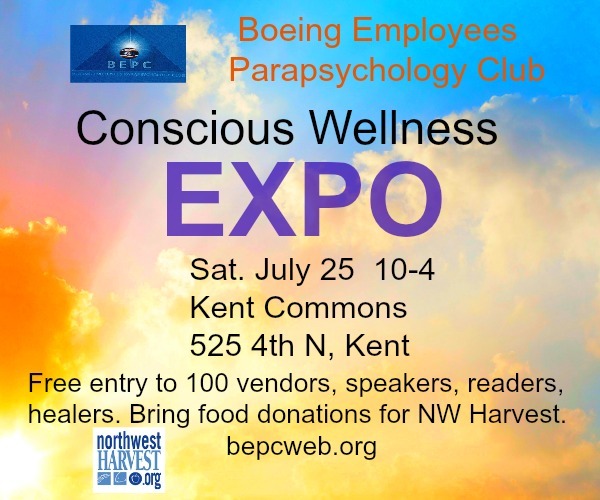 Gerry & I are excited to be one of the vendors at the Conscious Wellness Expo July 25, 2015 in Kent, WA. Besides offering Aura Photos and Chakra Imaging, we have copies of my latest book – Chakra Mastery: 7 Keys to Discover Your Inner Wisdom. Admission is free and I’m offering a copy of my new book as a door prize. See you there!